Meat is one of the best food to serve and eat. But the secret to making it the best is having a very tender and juicy piece. Anything hard is tough to eat and ruins the meat’s overall taste. That’s why having the best meat tenderizer should be one of your must-haves in the kitchen. We researched all over the internet and came up with some meat tenderizer reviews to help you pick out the best meat tenderizer tool that you can use in your own kitchen. We came up with a bunch of good brands for you to choose from. Also, we included a guide on how to make your meat tender as well as some excellent FAQ. What Can I Use to Tenderize Meat? What is a Natural Meat Tenderizer? How to Tenderize Meat Without a Mallet? How to Tenderize Sirloin Steak? How to Tenderize Steak for Grilling? How Do Chinese Restaurants Tenderize Meat? The OXO SoftWorks Meat Tenderizer is one of the best meat tenderizer hammer in the market. It’s a very simple tool and yet very effective. It has a flat side for pounding and a textured side for tenderizing meat. So, you’d have less effort pounding tough beef, pork, or chicken. The mallet features a soft non-slip handle that won’t slip out of your hands even when it’s wet. It’s also contoured ergonomically to comfortably fit your hands when tenderizing meat. Many users find that this traditional style meat tenderizer is very easy and effective to use because of its material, plus the double-sided use allows more tender meat. The hammer is also easy to clean and can be safely washed in the dishwasher. 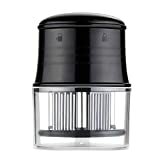 Overall, this is an ideal meat tenderizer to have in your kitchen that performs its function well. However, it is not so advisable to use on large pieces of meat because of its small size. But it lasts a long time because of its excellent quality and it is also easy to keep. The Lasting Charm Meat Tenderizer is a very compact meat tenderizer and can soften meat with a pressing motion. It’s a high-quality kitchen tool that can be used at home or in commercial kitchens. What makes it a useful tenderizer is it’s 48 stainless-steel blade feature that can penetrate even the toughest meat easily. It features 3 rows of blades that can cut through tough meat fibers without much effort. The razor-sharp stainless-steel blades puncture the meat with a pressing down motion but don’t destroy it. It can reduce the marinating time in half because your marinade can be easily absorbed by the meat faster, so you don’t have to wait for hours. Despite the compact space between the blades, this tool is very easy to clean with warm water and brushing is not required. You can also safely wash it in the dishwasher, lessening your clean up time. The spikes are very sharp that’s and that is why it has a safety lock to prevent puncture wounds and it also has a safety storage cap, so you can securely keep it while avoiding accidents. Overall, Lasting Charm is a very effective meat tenderizer that works well on meat. Many users love the product and say how it works well for them. It is effortless to use and doesn’t require much effort, unlike a pounding meat mallet that can be heavy. This is relatively small with a length of 5.9 inches and a weight of 11.2 ounces, so you don’t need much effort in using it. The KLEMOO Meat Tenderizer Tool is somewhat similar to the Lasting Charm Meat Tenderizer but at a bit higher price. This product also features 48 ultra-sharp stainless- steel blades that can puncture meats. It can create tiny holes in the meat to break down connective tissues that make the meat tough. Because it can puncture the meat, it can allow the marinade to go inside the meat and get fully-absorbed in as fast as 5 minutes. It can also cut cooking time by 40% because heat can penetrate the meat more quickly. With a faster cooking time, you get less nutrient and flavor loss, so you end up with a juicier and the meat taste better. The tenderizer tool is designed well with an outward curve top for a more comfortable non-slip grip while tenderizing meat, very ergonomic and comfortable for your hands. With a simple press down, you can tenderize your meats. Other than that, this product comes with a protective plastic cover to prevent accidental pricks and puncture wounds from the sharp blade, plus you can keep it clean and sanitary. This tenderizer is top-rack dishwasher-safe that allows you less time spent on cleaning. We love how KLEMOO is so easy to use and it’s the best meat tenderizer tool that you can have. We love its ergonomic design and simplicity and ability to perform its function well. It is very light with a weight of 10.4 oz and a length of 6.3 inches, so you don’t have to strain yourself too much when using this. 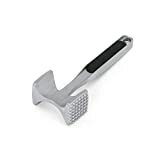 The KitchenAid Meat Tenderizer is another traditional style meat mallet that is made of aluminum material. It has a soft grip handle so that you can hold it comfortably and firmly without slipping from your hands. Unlike the professional Wusthof Meat Tenderizer, this product has a tenderizer head with both flat and textured surfaces to flatten or tenderize all types and cuts of meat depending on your preference. This mallet is a bit small with a length of 11 inches and a weight of 9.6 oz only. It is considerably lighter than other mallets in the market making it a lightweight option. But despite its small size, it is perfect for petite or even large hands folks, which is why many users love this product. The only downside to this item is that it can’t be washed in the dishwasher. The positive outlook on that is you can wash it yourself more thoroughly. Also, it’s not so terrible to clean it out because it doesn’t have small holes or spaces where food can get stuck into it. The KitchenAid Meat Tenderizer is one of the best meat tenderizer mallet because of its effective traditional design and lightweight. Its material makes meat tenderizing an easy task without having to carry much weight. The Jaccard Supertendermatic 48-Blade Tenderizer is another meat tenderizer tool that features 48 301 stainless steel blades. Which means you get solid steel that doesn’t easily corrode. It’s very effective in effortlessly cutting through the meat’s connective tissues and tough meat fibers that makes it tough. The razor-sharp blades can cut through any meat like beef, pork, chicken, veal, turkey, and others. It can puncture the meat and put holes which helps marinades go into the meat easily. It can also cut down cooking time by 40% that leaves you with a juicier and more flavorful meat. The downside of this product is that its handle is not ergonomically designed, but it is still made with comfort and is easy to grip. It is made of ABS plastic which is another sturdy material that can resist heat and has properties to withstand impact resistance and toughness. The product is 5.8 inches in length with a weight of 15.2 ounces, which is pretty heavy compared to the other meat tenderizer tools. However, you don’t have to constantly lift this up unlike mallet types of tenderizers so the weight may not be an issue. Many users love this product and have positive feedback on how sturdy and sharp the blade is. Despite having a hefty price, it is very worth it in terms of performance. This product comes with a 1-year hassle-free replacement and lifetime limited warranty, but first, you have to fill up a form on their official website at www.jaccard.com. The Koncle professional Needle Meat Tenderizer is another excellent meat tenderizer tool to consider. What makes it unique from others is its round shape and due to the circular body design, it can fit in 56 stainless steel blades, unlike others that have only 48. Because it has more blades, it means you’d also have to use less energy to press the tool down to tenderize the meat. It punctures through the meat so it helps you cut through meat easier and cook it faster and more evenly. It reduces cooking time so the meat can retain its juice more. The plastic body and handle are made of food-grade material and ABS plastic. The handles with spring are made to resist corrosion too. The 56 stainless steel blades are very sharp and hard so that it can puncture any meat that you want. This product also has a safety feature and protective cover that will protect your hands from accidentally getting punctured. The blades only deploy if it is pressed against meat and it will automatically retract once lifted. Cleaning is also effortless as you just have to soak it in warm water with soap and brush it off after a few minutes. Koncle is a very professional meat tenderizer tool which you can use in your own kitchen. It has a length of 11.9 inches and a very light weight of only 2.88 oz. So, if you’re looking for a very lightweight meat tenderizer then this is the best option for you. We go through hundreds of products listing at Amazon and also study the ratings left by previous buyers to find the best meat tenderizer for you. Besides that, we also calculate the overall net ﻿﻿﻿customer satisfaction (NCS) grade because we want to see how happy is the previous buyers with their purchase of the product. From our finding, we can say that OXO, KLEMOO and Jaccard are the best meat tenderizer brands. These brands are popular and received many excellent ratings for their products. Also, the OXO SoftWorks Meat Tenderizer, KLEMOO Meat Tenderizer Tool and Jaccard Supertendermatic Tenderizer score favorably for the ratings as well as the NCS grade compare to the rest. We believe that you would find these meat tenderizer a good buy too. A meat tenderizer is a tool that you use manually in the kitchen to tenderize tough meat cuts prior to cooking. Other than making the meat tender, it can also help lessen cooking time to keep the juice and nutrients of the meat, giving you a more flavorful dish. Here are the different types of meat tenderizers that you can choose from. The hammer type of meat tenderizer is the most common and traditional one. It looks like a hammer or mallet with a handle and two heads. It can be made of wood but it is more commonly made of metal like aluminum or stainless-steel. On one side of the tool has a flat surface while the other side has a pyramid-shaped texture for tenderizing meat. Sometime people use it to break larger chuck of ice too. A needle tenderizer features a series of blades that puncture the meat to make it tender. It cuts into the tough meat fibers to make it soft. 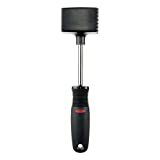 A potato masher type of tenderizer looks like a potato masher but has a short handle with a broad metal face that is either smooth or textured for tenderizing meats. Meat tenderizer machines are usually used in commercial or industrial companies who produce large volumes of meat. Just like any other product, the best meat tenderizer machine depends on who will be using it and how much meat will be processed. You can choose between the electrical meat tenderizer machine or manual heavy-duty models. The meat goes through the machine and there are blades that puncture the tough meat to make it tender. Despite being believed that putting salt before cooking will make the meat tough and dry, salt is an effective meat tenderizer. But you have to use coarse salt like kosher or sea salt and stay away from fine table salt that can be quickly absorbed by the meat. This is somewhat similar to br﻿inin﻿g wherein salt breaks down some tough protein structures in the meat. Tannin﻿﻿s are natural tenderizers and these can be found in wine, beer, tea, and coffee. Aside from that, these beverages contain other acids that can help break down proteins in tough meat. If you’re planning to use tea or coffee, make sure they are brewed strong and allow them to cool before marinating the meat. Maximum marinating time can be 24 hours. Working with acids can mean tenderizing meat with vinegar, lemon, lime, pineapple or tomatoes. When acids are used as a meat marinade, it softens tough muscle fibers and connective tissues, while making it even more flavorful. And what’s great about acids is that there’s a wide range of ingredients to choose from. You can make a very simple meat tenderizer recipe by adding just a tablespoon or two of vinegar to your cooking liquids, roasts, stews, or any meat dish to make it very juicy and tender. Wondering how to tenderize meat with baking soda? Just like salt, it can break down protein in meat. So just coat the meat with some baking soda an hour before cooking to draw the water from the meat and make it more tender. Drain it off with water and rinse well before cooking. Fruits and vegetables are another natural meat tenderizers such as pineapple, papaya, figs, kiwi that contain papain. This enzyme helps break down tough muscle fibers, which makes it an effective natural meat tenderizer. In addition to using a mallet, meat pounder, or other meat tenderizer tool, you can use a meat tenderizing powder. It contains natural enzymes like papain or bromelain which help break down the tough meat fibers. Make sure that you use the best meat tenderizer powder with great quality so that you end up with the most tender piece of meat. Before using a meat tenderizer powder, read the label to know the correct ratio to use with the amount of your meat. If you’re going to use powder on tough meat cuts like sirloin steak, first you have to mix it with your choice of marinade or seasoning. Then sprinkle the combined seasoning and powder on your sirloin steak or meat choice before you cook it. Poke the surface of the meat with a fork or press it with your fingers so that the meat tenderizer powder will penetrate the meat and allow its enzymes to break into more meat fibers in the meat. Marinade it for at least 45 minutes then cook it immediately to achieve exceptional flavor and tenderness. Grilling is one of the best ways to cook meat and there are specific techniques to grill meat and keep its tenderness. You can use the natural meat tenderizers that we listed here or use mechanical meat tenderizers that have blades that can cut through the meat. You can also pound the meat with a stainless steel meat tenderizer mallet, or you can even use a heavy cast iron skillet. Score the meat and make cross-hatch patterns using a sharp knife. Keep the incisions shallow to 1/8-inch only. Do this on both sides of the meat to cut through tough meat fibers and to cook it evenly. To achieve optimum tenderness and keep the juice inside, rest the meat after cooking and give it a minute or two before slicing. Slice it across the strands of meat so get a tender piece. If you are a frequent patron at a Chinese restaurant, for sure you’ve experienced eating dishes with very tender meat prepared by the restaurants. And their secret to having very tender meat texture is called velveting. It involves marinating the meat in a mixture of cornstarch, rice wine, egg whites, salt, sugar, and sometimes soy sauce for approximately 30-45 minutes. Then the meat is simmered in water or warm oil for 30-45 seconds or until almost cooked. This method ensures that the meat achieves a velvety texture. The water method is recommended if you’re planning to cook in advance and keep the meat for later consumption. This way ensure the meat still stay tender and juicy. Having the most tender piece of meat is made easy with our best meat tenderizer list. There are many types of tenderizers and brands to choose from but we sort out the top quality ones for your convenience so you do not need to get confused on which one to pick. From our list, our top picks are OXO SoftWorks and KLEMOO because they are two different types of meat tenderizers that function very well with its advantages. They both have high user rating and feedback and prove to be very worth it. Both are very easy to use and works very well with any meat.